Delaware's location within the U.S.
Penn ordered a court town to be laid out, and the courthouse was built in 1697. The town of Dover, named after the town of Dover in England's Kent, was finally laid out in 1717, in what was then known as the Lower Counties. It was designated as the capital of Delaware in 1777. 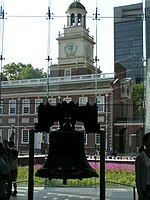 In 1787 Delaware was first state to ratify the U.S. Constitution, and became "the First State." Through much of the late 18th century, the economy of Kent County was based on small grain farms. As a result, farmers did not need as many slaves as did owners of tobacco plantations. Delaware had a high proportion of free blacks among its African-American population by the early 19th century. In the 1960s, Dover was a center of manufacturing of spacesuits worn by NASA astronauts in the Apollo moon flights by ILC Dover, now based in the small town of Frederica. The suits, dubbed the "A7L," was first flown on the Apollo 7 mission in October 1967, and was the suit worn by Neil Armstrong and Buzz Aldrin on the Apollo 11 mission. The company still manufactures spacesuits to this day—the present-day Space Shuttle "soft" suit components (the arms and legs of the suit). Kent County, like all of Delaware's counties, is subdivided into Hundreds. There are several explanations given for how the Hundreds were arrived at, either being an area containing 100 families, an area containing 100 people, or an area that could raise 100 militiamen. Kent County was originally apportioned into six Hundreds: Duck Creek, Little Creek, Dover, Murderkill, Milford and Mispillion. In 1867, the Delaware legislature split Murderkill Hundred into North Murderkill Hundred and South Murderkill Hundred. In 1869, the legislature formed Kenton Hundred from parts of Little Creek and Duck Creek Hundred. Today the county contains eight Hundreds. As of the census of 2000, there were 126,697 people, 47,224 households, and 33,623 families residing in the county. The population density was 215 people per square mile (83/km²). There were 50,481 housing units at an average density of 86 per square mile (33/km²). The racial makeup of the county was 73.49% White, 20.66% Black or African American, 0.64% Native American, 1.69% Asian, 0.04% Pacific Islander, 1.27% from other races, and 2.22% from two or more races. 3.21% of the population were Hispanic or Latino of any race. 13.3% were of German, 11.3% United States or American, 10.9% Irish, 10.0% English and 5.4% Italian ancestry. 92.5% spoke English and 3.3% Spanish as their first language. There were 47,224 households out of which 35.50% had children under the age of 18 living with them, 52.90% were married couples living together, 13.80% had a female householder with no husband present, and 28.80% were non-families. 23.00% of all households were made up of individuals and 8.40% had someone living alone who was 65 years of age or older. The average household size was 2.61 and the average family size was 3.06. In the county, the population was spread out with 27.30% under the age of 18, 10.10% from 18 to 24, 29.80% from 25 to 44, 21.20% from 45 to 64, and 11.70% who were 65 years of age or older. The median age was 34 years. For every 100 females there were 93.10 males. For every 100 females age 18 and over, there were 89.60 males. The median income for a household in the county was $40,950, and the median income for a family was $46,504. Males had a median income of $32,660 versus $24,706 for females. The per capita income for the county was $18,662. About 8.10% of families and 10.70% of the population were below the poverty line, including 14.80% of those under age 18 and 8.80% of those age 65 or over. ^ Delaware History Online - Geography - Hundreds Archived July 16, 2012, at the Wayback Machine. Hsd.org. Retrieved on 2013-08-17. ^ Delaware Hundreds Archived 2012-07-16 at the Wayback Machine. Delgensoc.org (July 16, 2010). Retrieved on August 17, 2013. ^ "Dave Leip's Atlas of United States Presidential Elections". Retrieved June 11, 2011. ^ "Population and Housing Unit Estimates". Retrieved December 3, 2018.